Stewart, James. Calculus: Early Transcendentals 7E Hybrid. Stewart, James. Single Variable Calculus: Early Transcendentals, Volume 1. Stewart, James. 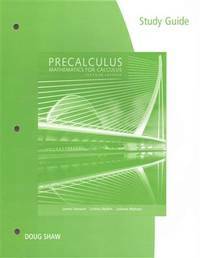 Precalculus: Mathematics for Calculus (Oakland Comm College Special Ed) (Precalculus: Mathematics for Calculus Oakland CCommunity College Special Edition). Stewart, James; Redlin, Lothar; Watson, Saleem. Precalculus: Mathematics for Calculus (Available Titles CengageNOW). Clegg, Dan; Frank, Barbara. Stewart's Multivariable Calculus, Fifth Edition (Student Solutions Manual). From Precalculus to Single Variable Calculus Early Transcendentals - Student Solutions Manual, from	Functions Modeling Change to Calculus Of Variations, we can help you find the calculus books you are looking for. As the world's largest independent marketplace for new, used and rare books, you always get the best in service and value when you buy from Biblio.com, and all of your purchases are backed by our return guarantee. Boston: Prindle, Weber & Schmidt, 1986. Due to the weight of this volume, it can only be shipped to delivery addresses located within Canada and the United States. Previous Owner Markings (Including Highlighting); Corners, Spine, Boards Bumped; Light Shelf Rub to Boards; Spine Slightly Cocked; Edges Lightly Soiled. BOOK NUMBER: 33L2820. SPONSORING EDITOR: David Pallai. PRODUCTION AND DESIGN: Sara Waller. PRODUCTION COORDINATOR: Helen Walden. COVER DESIGN: Kathi Townes. COVER PHOTO: Randall Sluder and Gerald Boquist of Technology International Corporation, Bedford, Massachusetts. This 9-minute exposure shows the launch of a 3-stage sounding rocket near Fairbanks, Alaska. The rocket injected a pair of barium payloads into the lower magnetosphere, and the resulting clouds' motions were used to study an aurora in progress. Circumpolar stars include the constellations of Ursa Minor at top, Auriga at lower left, and Andromeda at lower right. CONTENTS: 1 Functions 2 Limits of Functions 3 The Derivative 4 Applications of the Derivative 5 The Integral 6 Applications of the Integral 7 Inverse Trigonometric Functions 8 Logarithmic and Exponential Functions 9 Techniques of Integration 10 Indeterminate Forms and Improper Integrals 11 Sequences and Series 12 Analytic Geometry in the Plane 13 Parametric Equations and Polar Coordinates 14 Vectors and 3-Space 15 Vector-Valued Functions 16 Differential Calculus of Functions of Several Variables 17 Multiple Integrals 18 Vector Integral Calculus 19 Differential Equations; Appendices; Answers to Odd-Numbered Problems; Index. EXCERPT: Preface - This book is intended for a three-semester or four-quarter course in calculus for students of science, engineering, mathematics, and business. It reflects several of my more strongly held, though hardly original, viewpoints: that a calculus text should present the trigonometric functions as early as possible; that it should motivate and explain the idea of a limit in a manner that is as simple as possible; and that there should be an abundance of, and emphasis on, applications . . . Each chapter begins with its own table of contents and introduction to the material covered in that chapter and ends with a Chapter Test, which includes true-false and fill-in-the-blanks questions. Most sections conclude with brief informal discussions labelled Remarks. These discussions include possible applications of the mathematics just covered, a little bit of history, or a few words of caution to the student on possible misinterpretations or unwarranted generalizations of definitions and theorems. Illustrations are used generously throughout the text (there are approximately 1200). Most exercise sets are massive (with over 6000 problems in the text) and include the usual abundance of drill problems along with Miscellaneous Problems, which are either more challenging in nature or expound on material not formally presented. Exercise sets include calculator Problems, which are intended to be done on a calculator or computer. Answers (including graphs) to odd-numbered problems are included in the text. A complete solutions manual for the instructor and a student solutions manual, which provides a detailed solution to every fourth problem, are available.... First Edition 3rd Printing. Hard Cover. Good/No Jacket (As Issued). Illus. by J&R Services. 4to - over 9¾" - 12" tall. New York: Theodore Audel & Co., 1901. Hardcover. Very Good/No Jacket. 8vo - over 7¾" - 9¾" tall. COLOR FRONTISPIECE 146 FIGURE ILLUSTRATIONS "Comprising the elements of mechanical philosophy, mensuration, geometry, algebra, arithmetical signs, and tables. United States Weights, Measures and Money, Tables of Wages, with Copious Notes, Explanations and help Rules Useful for an Engineer. And for Reference, Tables of Squares and Cubes, Square and Cube Roots, Circumference and Areas of Circles Tables of Weights of Metals and Pipes, Tables of Pressures of Steam, etc. Good green cloth. Black endpapers. Some wear, soiling, foot of spine wear, rear hinge starting. (1901), 8vo, xi, 12-330pp. Cambridge, England: Deighton, Bell, and Co., 1883. Reprint Edition . Hardcover. Fair/No Jacket. 16mo - over 5¾" - 6¾" tall. Author Fellow of St. John's College, Cambridge. ILLUSTRATED Fair brown cloth. Slight wear. Missing spine and rear cover. 1883, 16mo, viii, 192pp. 16 page advertising catalogue bound in. Boston: Houghton Mifflin Company, 1961. Second Printing . Hardcover. Very Good/No Jacket. 8vo - over 7¾" - 9¾" tall. In statistics, as in other disciplines, a certain amount of pedagogical energy is devoted to mere terminological problems. This is inevitable, since the only channel of communication is terminology. Not until an author has examined several hundred standard references, in the process of increasing that number by one, does he realize the variation in the use of concepts...." Very good red cloth. Slight wear, sticker mark. previous owner name inside. 1961, 8vo, xv, 442pp. 1999-09-08. Good. Ships with Tracking Number! INTERNATIONAL WORLDWIDE Shipping available. May not contain Access Codes or Supplements. May be ex-library. Shipping & Handling by region. Buy with confidence, excellent customer service! Brooks/Cole, 2000. Hardcover. Good. Disclaimer:A copy that has been read, but remains in clean condition. All pages are intact, and the cover is intact. The spine may show signs of wear. Pages can include limited notes and highlighting, and the copy can include previous owner inscriptions. An ex-library book and may have standard library stamps and/or stickers. At ThriftBooks, our motto is: Read More, Spend Less.Dust jacket quality is not guaranteed. EXCELLENT CONDITION!!! No markings. No highlighting. No missing pages. No worn-out pages. Brooks Cole, 1999. Spiral-bound. Acceptable. Disclaimer:A readable copy. All pages are intact, and the cover is intact. Pages can include considerable notes-in pen or highlighter-but the notes cannot obscure the text. At ThriftBooks, our motto is: Read More, Spend Less.Dust jacket quality is not guaranteed. 1 p.l., 53 pp. Large 4to, attractive modern marbled boards, red morocco lettering piece on spine. Göttingen: Dieterich, 1830. First separate edition, originally published in the Comm. recent. Soc. Gött., Vol. VII (1828-32). This is Gauss's "one contribution to capillarity and an important paper in the calculus of variations, since it was the first solution of a variational problem involving double integrals, boundary conditions, and variable limits. "-D.S.B., V, p. 305. Fine copy. &#10087; Poggendorff, I, 854-57. Boston: Allen & Unwin, 1983. First Paperback Edition . Paperback. Fine/No Jacket. 8vo - over 7¾" - 9¾" tall. Fine gray trade paperback. (1983), 8vo, xvi, , 169pp. , "Skilled geological enquiry depends upon careful observation, meticulous documentation and painstaking analysis, frequently on the basis of very little information. Statistical knowledge can provide a set of data-handling and decision-making tools to aid the geologist, and this book is about the methods relevant to geological problems." New York: Henry Holt & Co., 1915. Hardcover. Very Good/No Jacket. 8vo - over 7¾" - 9¾" tall. Very good green cloth. Some wear, soiling, previous owner name inside. 1915, 8vo, vii, 384pp. "Change from complex to real variable. We can readily deduce the law for the change of the independent variable in a definite integral of a complex variable. ..."
Several diagrams in the text. 1 p.l., 33 (i.e. 29) pp. Large 4to, orig. blue wrappers, uncut. London: W. Bulmer, 1814. First separate edition, with new pagination. This offprint belonged to Carl Friedrich Gauss, with the "Gauss-Bibliothek" stamp on the title. This copy was no doubt sent by Herschel to Europe's leading mathematician. The present work is an important contribution to mathematical notation by Herschel, who was, with Charles Babbage and George Peacock, a founder of the famous Analytical Society, a group of Cambridge mathematical reformers. They wanted to leave behind the fluxional, Newtonian notation so prevalent in 18th-century Britain and embrace the algebraically based conception of the calculus developed by Lagrange. In this work, Herschel professes "his belief in the fruitfulness of the method of separating the symbols of operation from those of quantity."-S.E. Despeaux, "Very Full of Symbols" in Episodes in the History of Modern Algebra (1800-1950), (2007), ed. by J.J. Gray & K.H. Parshall, p. 54. Fine copy and rare. With the stamp of the Royal Observatory at Göttingen on upper wrapper (with release stamp on front paste-down endpaper) and title.